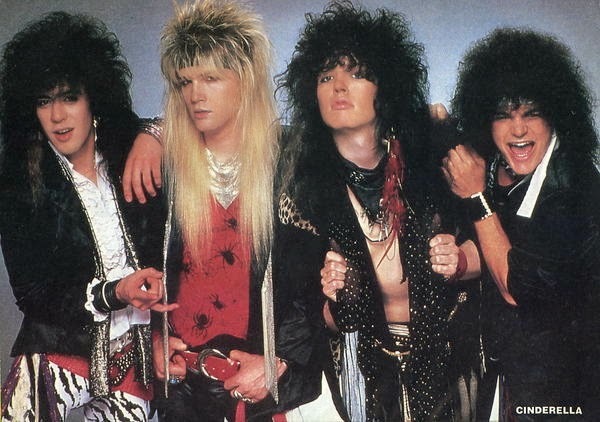 Cinderella was formed in Philadelphia in 1982 by singer-songwriter, keyboardist, and guitarist Tom Keifer and bassist Eric Brittingham. The initial lineup also included guitarist Michael Smerick and drummer Tony Destra. In 1985, Smerick and Destra left to form Britny Fox, another Philadelphia-based glam metal band that later relocated to Los Angeles. Cinderella got their big break when Jon Bon Jovi saw them perform at the Empire Rock Club in Philadelphia and recommended that his A&R rep Derek Shulman who knew of the band, to see them as well. In 1985, with a recording contract with Mercury/Polygram Records in the works, guitarist Jeff LaBar and drummer Jim Drnec joined the band. During the recording of the band's debut album, Night Songs, studio session drummer Jody Cortez was brought in when producer Andy Johns found Drnec difficult to work with. While finishing the recording, Drnec was replaced by former London drummer Fred Coury, who joined in time to make the album's cover and play on upcoming tours. Night Songswas released on August 2, 1986 and eventually achieved triple platinum status, selling 50,000 copies per week at one point. The album reached #3 on the Billboard charts in February 1987. Cinderella's first tour was in 1986 with fellow glam metal rockers Poison, opening for Japanese heavy metal band Loudness. Further tours into 1987 were spent playing to large arena audiences: five months opening for former Van Halen frontman David Lee Roth, and seven months with Bon Jovi, taking the opening slot for their Slippery When Wet tour. Later that year, the band went overseas, appearing in Japan, Scandinavia, and at the Monsters of Rock festivals in England and Germany. The music video for "Shake Me", from their debut album starts off with a Cinderella-like girl falling onto her bed, her two evil sisters enter the room and tell her the work isnt done so she has to stay home while they go to the Cinderella concert. Later it shows her at the concert rocking with the band while the two sisters are still trying to gain access to the concert. The video ends with the girl getting into a limo with the band. The music video for "Nobody's Fool" continues the storyline from where the "Shake Me" video leaves off, following the Cinderella-like girl as she accompanies the band to their rehearsal space, with the wicked sisters in pursuit. As the band performs the song, the girl runs home for the stroke of midnight when her rocker outfit changes back to a plain dress. She later meets the band again for an autograph, and the video ends as a glint of recognition passes across Tom Keifer's face. Cinderella's second album, Long Cold Winter, was released in 1988. It signified a shift towards blues-rock, though it could still be described as glam metal. A 254-show tour to support the album lasted over 14 months and included dates on the Moscow Music Peace Festival alongside other metal acts, such as Ozzy Osbourne, Scorpions, Mötley Crüe, Bon Jovi, and Skid Row. The tour's stage show included Keifer being lowered to the stage while playing a white piano during their radio hit "Don't Know What You Got (Till It's Gone)".